As the work week was drawing to an end, I was feeling the itch to get on the road again this weekend. I didn’t want to go super far from home (4-5 hours max), but I also wanted to travel some place new. That really only left two options for me geographically. One destination I’m already planning on visiting in a couple weeks, which I’ll talk about when the time comes. That really only left one option: Western Arizona. 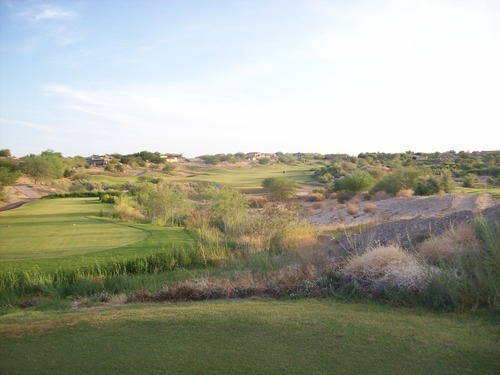 There isn’t that much golf to choose from in this region and it’s definitely not known as a golf destination, but I have always been looking for an excuse to play Emerald Canyon in Parker. I did that on Sunday as I made my way back home, but Saturday found me in the Spring Break party capital of the West… Lake Havasu. I knew it was going to be boiling hot out there, which offers both pros and cons to me. 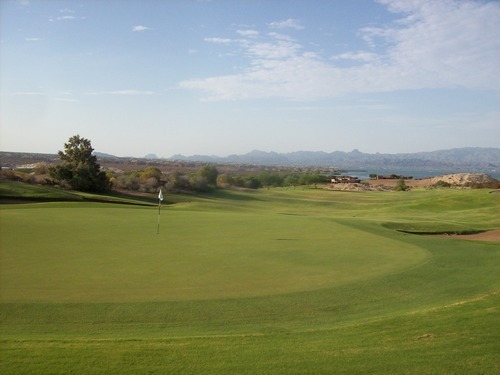 The positives are that there are less golfers out on the courses, and the prices for golf and lodging will be nice and cheap. 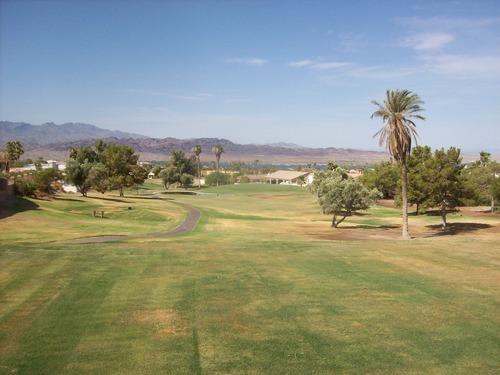 On the other hand, the desert heat can be draining and the courses generally aren’t going to be in their best condition. 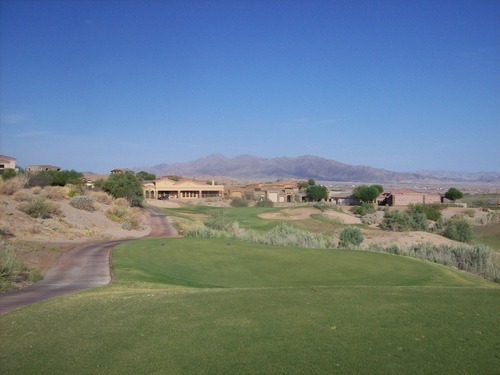 The Refuge considers itself a private course amidst a nice gated community just north of the main part of town. However, their website clearly promotes a “member for a day” offer. All you have to do is call and ask, and it’s really easy to get on as a guest pretty much any day of the week. 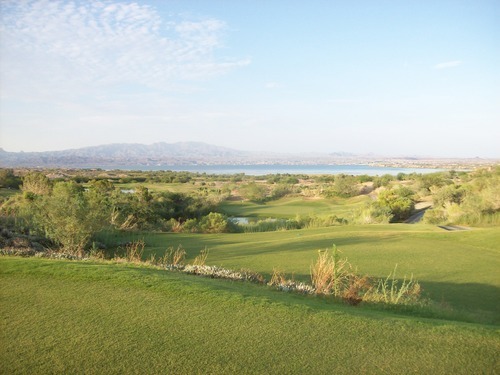 The price was $49, which included 18 holes of golf, range balls, a $10 food voucher in the restaurant and some other club amenities, too. It’s a solid deal for what is definitely the best course in town. Things are pretty casual here during the slow summer months, so the guy in the pro shop just told me that I could head out at my convenience and things were basically just first come, first serve on the course. I headed over to the first tee around 6:00 and found a twosome about to tee off. I could see other groups already out ahead of them, so I decided to join them. However, one of the guys was a beginner and I could tell he was self conscious about his slow play. They kind of urged me to go ahead on my own, so I ultimately did. I passed through a couple other groups on the front nine and then didn’t run into anyone else until the last few holes. It was a great pace of just over two hours. It was already quite warm that early in the morning, but there was enough of a breeze coming off the lake that it wasn’t too bad. The original Refuge course was designed by Arnold Palmer and meant to be an exclusive private club, but a lot has changed over the years. 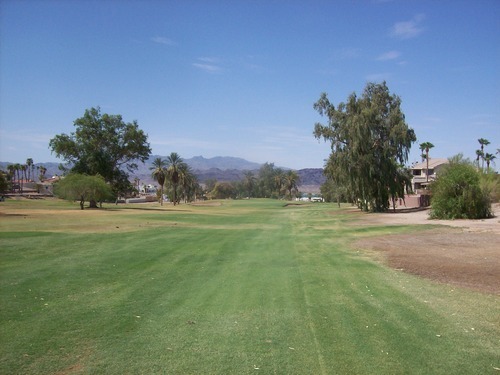 It was very clear when I played it that a lot of the course routing and layout has changed, so I wasn’t sure why. 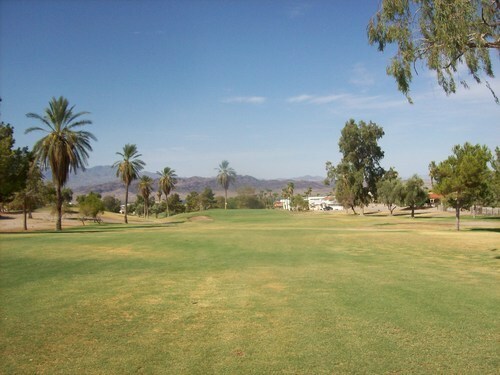 I read a review on Yelp that says they made some changes to accommodate construction of an RV park on site and can no longer tout the course as a Palmer design because it has been altered so much. Some things I couldn’t help but notice was the shell of a former hole in the middle (what would fall as the 6th hole in the current routing). It’s still kind of there and the green looks somewhat maintained, but it clearly hasn’t been used in awhile. 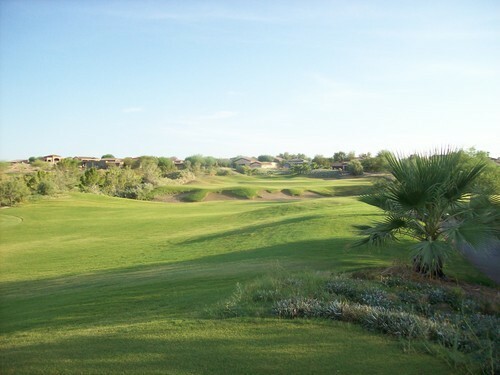 Too bad because it looks like a neat par-4 design. 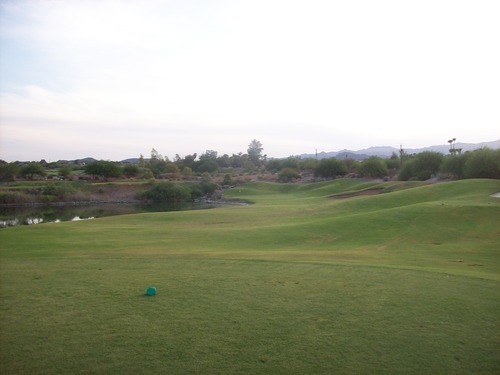 Then, the following hole obviously used to be a really cool par-5 that has been split into an awkward par-4 and an average par-3. The back nine has been changed around, too. I didn’t notice any holes that seemed particularly out of place (maybe the 13th), but various alterations have been made for whatever reasons. I can only imagine how much greater the course was in its original state, but it is still a really fun layout. 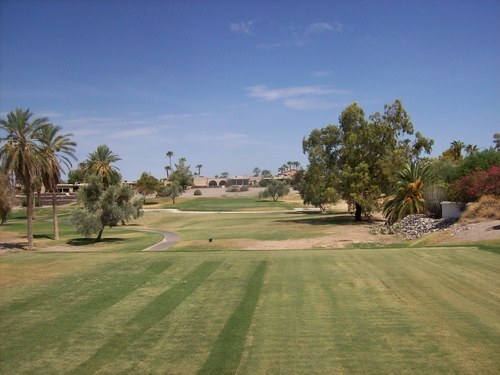 I emphasize “fun” because it is much shorter than it used to be and almost plays more like an executive course now. 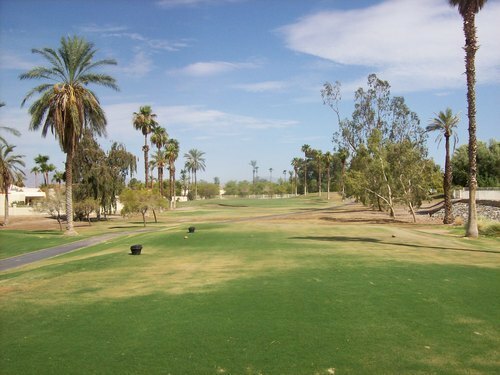 I found an old scorecard online that lists the black tees at 7,083 yards and the gold tees at 6,610. 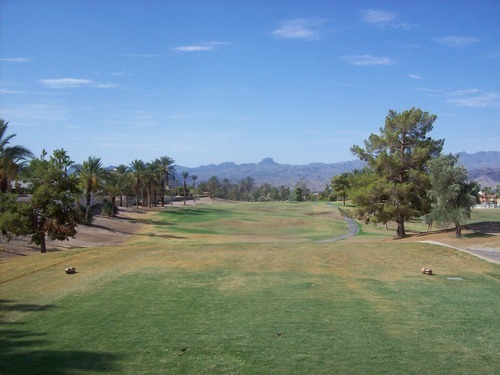 The course played to a par of 72 with five par-3s and five par-5s. 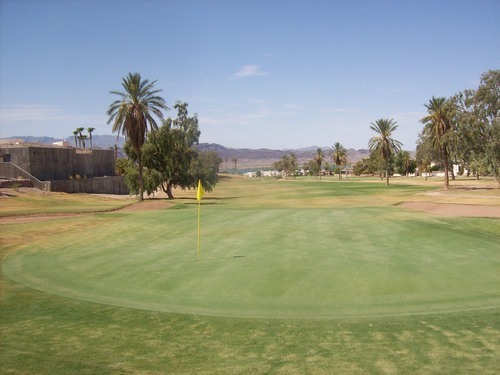 By contrast, the course is now a par-70 with seven par-3s and five par-5s, several of which are relatively short. 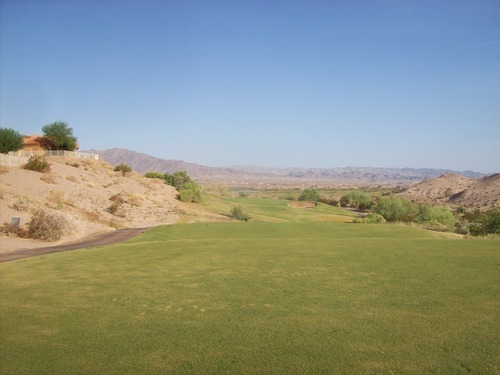 From the black tees, it is 6,230 yards. From the golds, it is just 5,651. That’s a pretty massive difference. I bring this up because it’s hard to ignore these facts. However, I would still recommend this course in a heartbeat. It is an enjoyable short-ish course design. 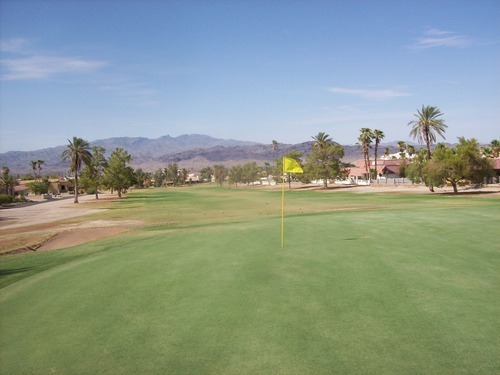 I wouldn’t call it “target” golf as there is some forgiveness from tee to green on most holes, but there is plenty of trouble in play if you are hitting the ball a bit wildly. 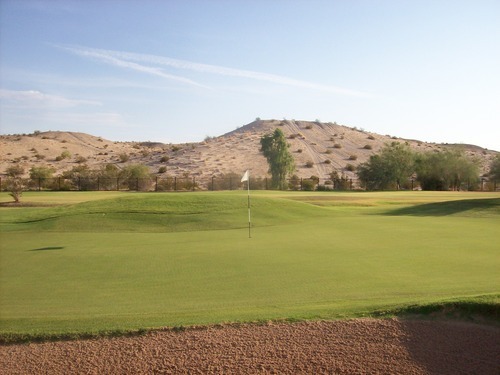 There are plenty of native desert areas, well placed bunkers and several nice water hazards incorporated into the layout to force good shots. But as long as you stay out of trouble, you should post a pretty good score. 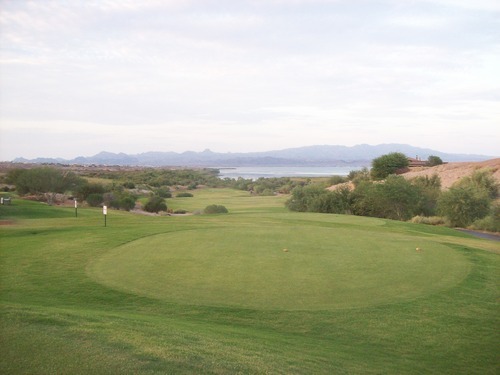 The Refuge is a pretty scenic course, as well, offering several elevated views of Lake Havasu in the distance and surrounding desert and mountains in every direction. 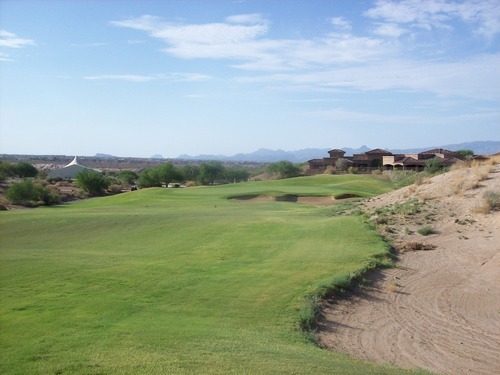 The contours of the course are nicely framed and it’s a great visual presentation, as is almost always the case with Palmer designs. 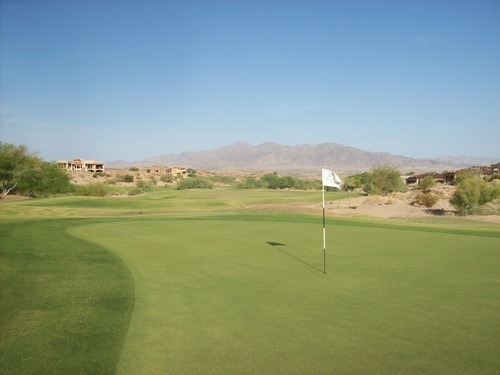 The course was in pretty good shape for mid-summer. One of the guys I started off playing with told me they had some heavy rains recently, which helped green it up a bit more. 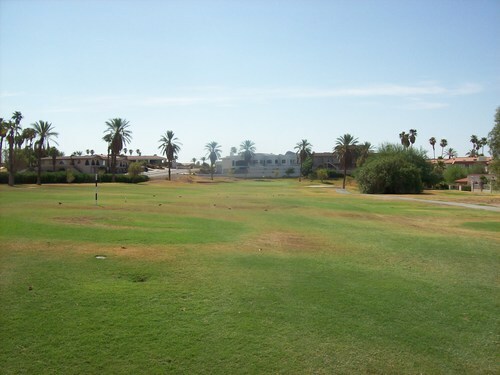 There were still patches of light green and brown with the bermuda turf. There were some thin spots and really bad areas marked as GUR, as well as other spots that were probably a bit too shaggy. 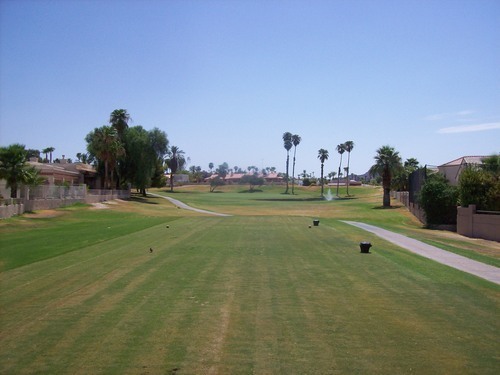 However, things were plenty playable throughout the tee boxes, fairways and rough. Definitely as good as I could have hoped for. 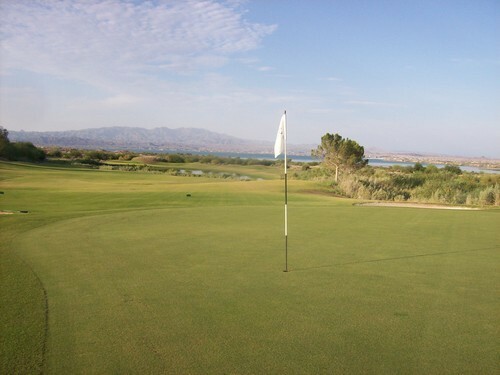 The greens had been punched very recently. They were not sanded at all, though, so just the holes for some bumpy and slow putts. For whatever reason, I putted really, really well, so they worked for me. The bunkers had really good soft sand (more like dirt or maybe silt from the river/lake bed? ), but there were a lot of rocks and pebbles in them. 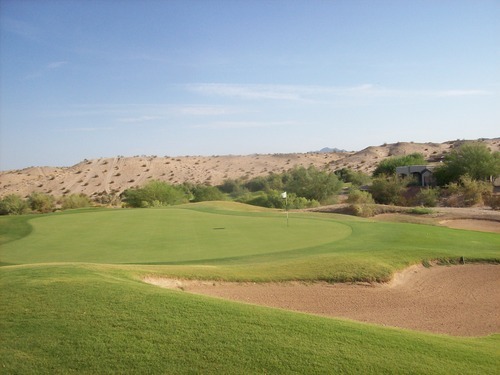 That often comes with the territory on desert courses. 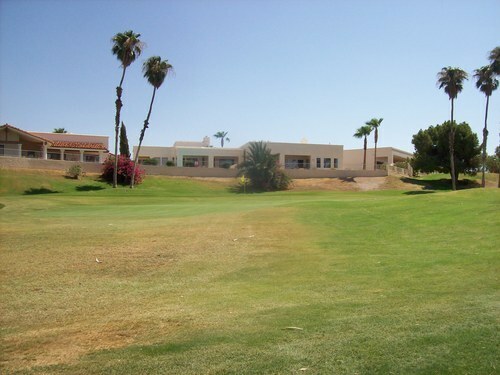 I can imagine longtime members and/or people who really knew and loved The Refuge course back in its heyday are probably a little disappointed with how it plays now. However, as a first-time visitor with no prior knowledge or judgments, I still had a very good time here. The people there were very nice and it’s an enjoyable course on most levels. I wouldn’t consider it a “destination” course by any stretch, but definitely worth playing while in town. 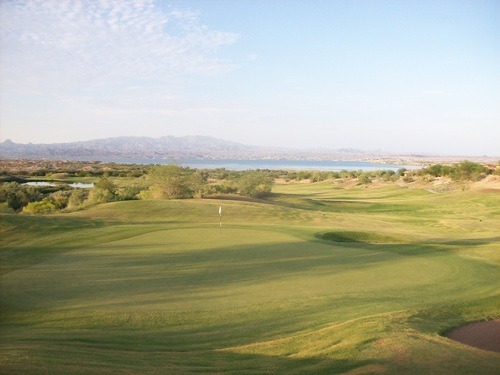 Note: This course has changed its name to Lake Havasu Golf Club. What was previously known as the Olde London Course is now the West Course (I think). 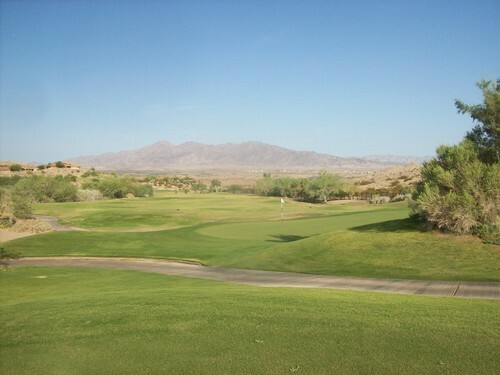 I booked a 9:28 tee time through GolfNow because their rate ($30) was a few bucks cheaper than the course’s rack rate ($35). It did end up being $32.50 after tax. The place was pretty dead when I got there around 9:00. The nice lady in the pro shop grilled me to make sure I was properly hydrating, but the heat really didn’t turn out to be an issue here. In fact, the wind was blowing steadily all morning. That made the golf tougher, but it kept the temperature tolerable. 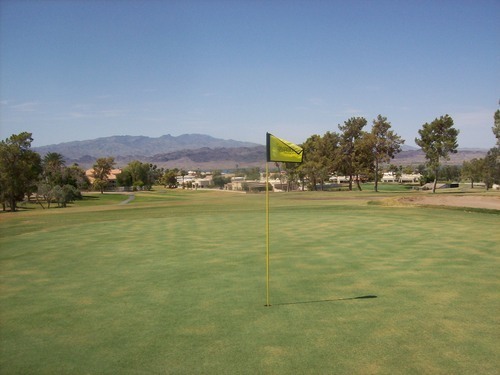 Ultimately, I was glad I played both my rounds in Havasu during the windy morning hours. 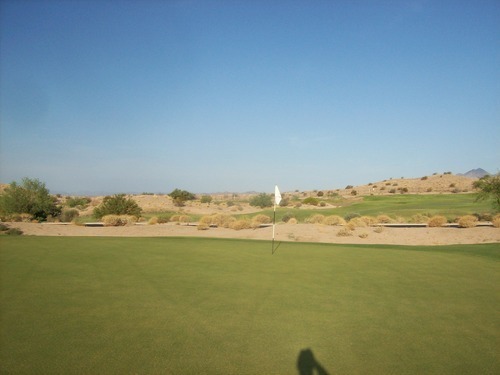 Later on in the day (late afternoon), the wind had died and it was a brutal 115 degrees in town! Luckily, I was done with my golf by then. Anyway, I headed right out to the first tee. I saw a few groups on the back nine, but never caught anyone and was done in about two hours. There are two courses at London Bridge. I played Olde London, which is the older of the two courses. The other is Nassau, which is currently closed for its summer maintenance. The Olde London course had just reopened from its own maintenance, so I was hoping that would mean good things regarding conditions. Unfortunately, that didn’t turn out to be the case. 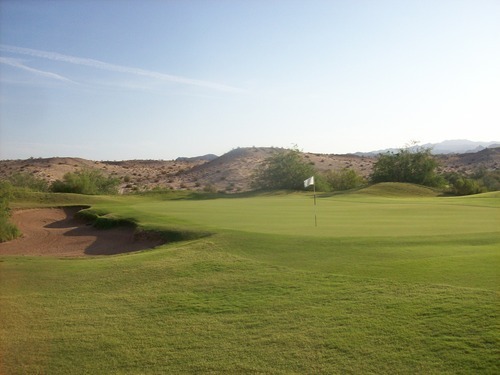 I can give the course a little slack with this being the dead of summer in the desert, but I don’t imagine they ever get this place looking “pristine.” It’s a little rough around the edges and that’s fine. Even at its best, Olde London wouldn’t really be much of a showstopper anyway. The original nine holes at London Bridge opened in 1967, then they later added nine more to complete what is now the Olde London course. Nassau came along after that to make it a 36-hole complex. From what I could see of Nassau, it didn’t look too dramatically different than Olde London. The front nine of Olde London, which I presume is the original nine, has the the feel of a quirky old design. 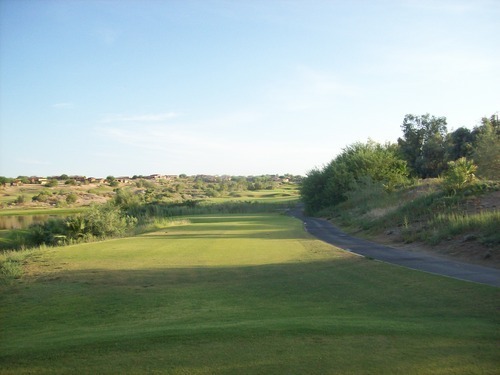 It has a lot of narrow tee shots and some tricky doglegs. 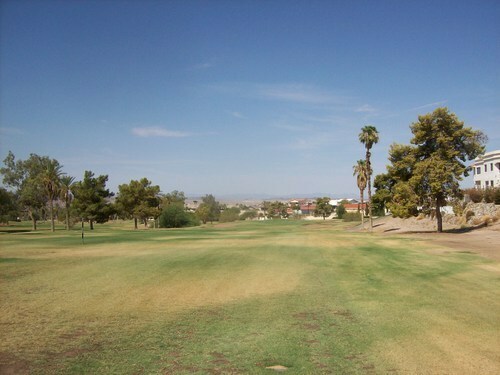 There are houses and streets surrounding the course as it weaves through a neighborhood. It feels uncomfortably tight at times. 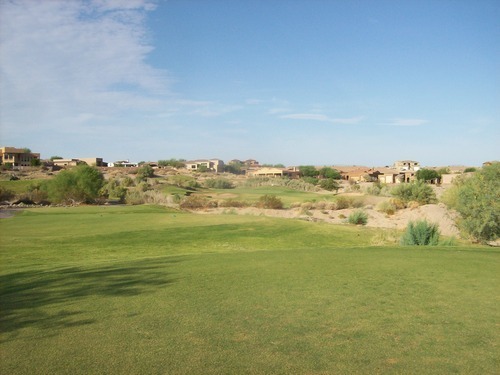 In some places, you really don’t have to mis-hit your ball by much to bring houses into play. 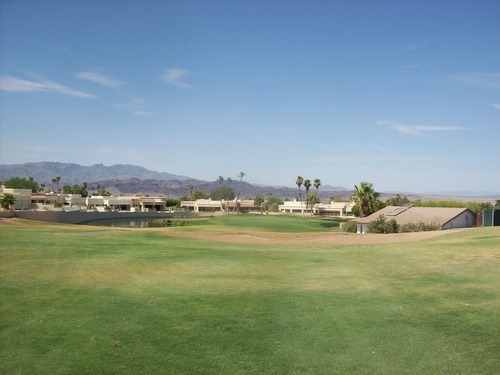 The back nine is a little more contained within the property and is a nicer design overall. It’s not that exciting, but I liked it better. As mentioned, the course wasn’t in very good summer shape. I’m not sure what it looks like in peak condition other parts of the year, but it was pretty beat up on this visit. 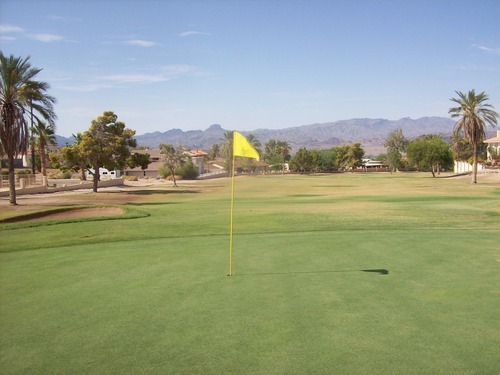 I will say the greens were pretty nice for mid-summer—firm and relatively slow, but mostly smooth surfaces. It was hard to make a ball mark, so that helped with keeping them smooth on top. 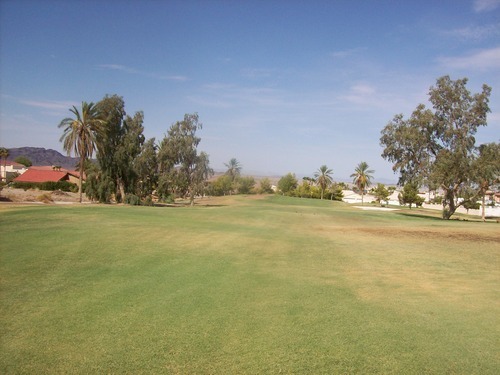 The fairways were very patchy with some really shaggy spots and a lot of bare sections. A ton of pigeons were out there snacking on whatever seed they had put out. 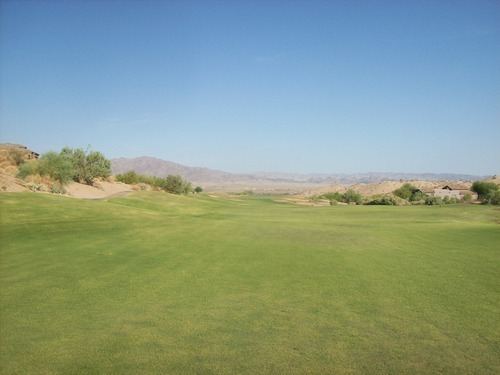 There really isn’t any rough as the fairways just kind of blend unceremoniously into the dirt/sand on the outer edges. The bunkers had decent sand and were consistent with how they played. They were a tad thin, but playable. 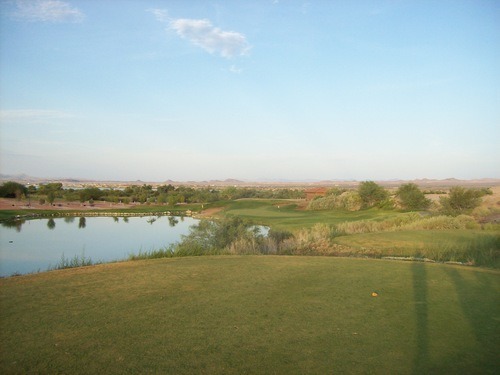 The London Bridge courses serve their purpose for locals looking to get out and play some golf or visitors just wanting a relaxed round at an affordable price. There aren’t many choices in town to begin with, so you can’t be too picky I guess. The Refuge and the two London Bridge courses are the only regulation-length layouts, compared with a few other short courses in the area.